The Scheme of Work for the Higher Secondary First year and Second year has been published. The complete portions in each subject are divided and clubbed together term wise. A glance at the scheme of work prepared by the State Council for Educational Research and Training (SCERT) will enable the teachers and students as well to know the portions to be covered in each term. It has been already informed that the question papers for the term exams will be prepared further by the Directorate of Higher Secondary Education (DHSE) instead of the usual procedure of preparation of Term exam questions by the school itself. This is being done with a view of bringing in unanimity in the conduct of examinations and evaluations in the Higher Secondary Education sector and thereby create a healthy academic standard for students. The question papers in all subjects for the first / second / model exam set up by DHSE are based on the scheme of work published now by the Higher Secondary Education Department. 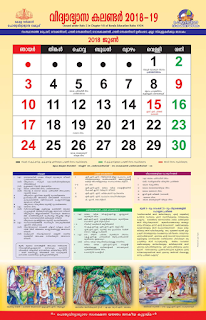 The scheme of work prepared by the SCERT, Kerala gives a clear view of the units and chapters in the text book, allotted for each month for ensuring a smooth course of study. The scheme provides each unit in the Higher Secondary Plus One/Plus Two Course Book, hours of study needed to complete the portions, periods of study of each chapter etc. Click the link given below to download the scheme of work for the Plus One and Plus Two classes.